Behold, the Cookie Au Lait Hot Fudge Sundae! 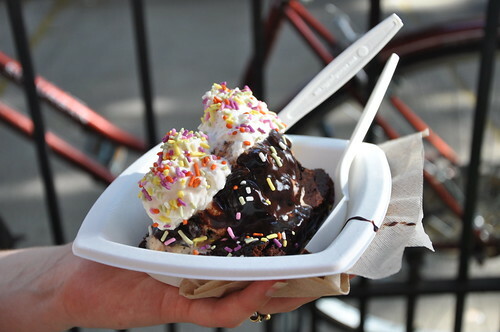 That’s a scoop of Cookie Au Lait ice cream (espresso ice cream made with Brooklyn Roasting Company Espresso and Back-To-Nature Sandwich Creme Cookies) perched atop a dark chocolate fudge brownie smothered in their hot fudge then tricked out with rainbow sprinkles, and home-made whipped cream. Cookies Au Lait holds a special place in my heart, it’s the flavor I voted to save to the permanent menu when Ample Hills recently trimmed their daily offerings down to 16 flavors. Blondie voted to save it too and what do you know, but Cookie Au Lait finished just 2 votes ahead of the next most popular flavor. It’s coffeetastic and cookietacular. You’re welcome.